This fight is killing the LGB and transgender community. 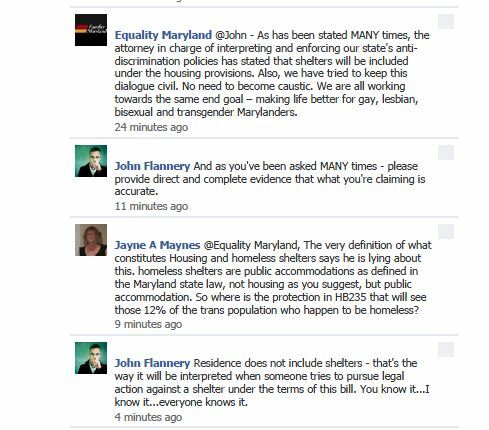 On equality maryland’s facebook page their own members, the ones who haven’t been deleted or banned yet, are calling Sheets out for the crushing oppression of the transgender community.Whether you’re gay, (HRC) lesbian, (NGLTF) bisexual, transgender, (shill} gender queer (eqMD man in a dress} or an ally (paid lobbyist), your voice is essential to our fight for equality (oppression). IT’s all too obvious you Lureen sock puppet or whatever you are calling yourself today you are a shill also. 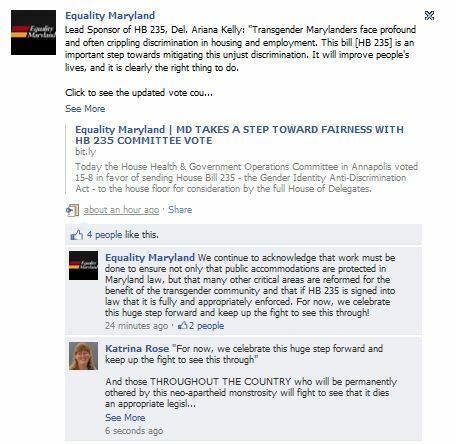 Transgender Marylanders are adamantly opposed to HB235 and now the GAY organizations who are shoving this down their throats! OPRESSORS! KILLERS!! MURDEROUS GAY ORGANIZATIONS!!! STOP this killing my people. And speaking of the Pinocheets regime‘s standard operating procedure of disappearing all that disagrees with it, here’s a colloquy that took place just before I started this post but was erased before I could get to this point in the post. 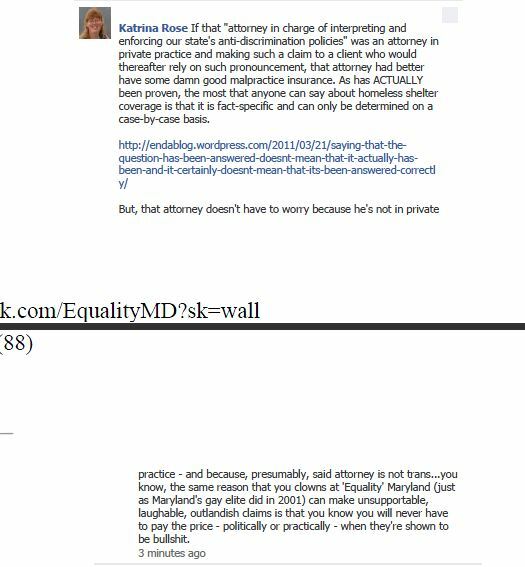 Apparently, Maryland transphobes still haven’t gotten the hint that people are able to keep records (what I’ve included here are JPG screensnaps off of the PDF file that I dumped of the ‘Equality’ Maryland Facebook page; unfortunately my comment was bifurcated by a pagebreak – hence the interrupting letters) of what transpires on the Internet. I hope you don’t think that no one saved screen snaps of the colloquy in which you, yet again, refuse to acknowledge that your theory about homeless shelters is even more fraudulent and empty than the 2001 theory of general trans coverage was. 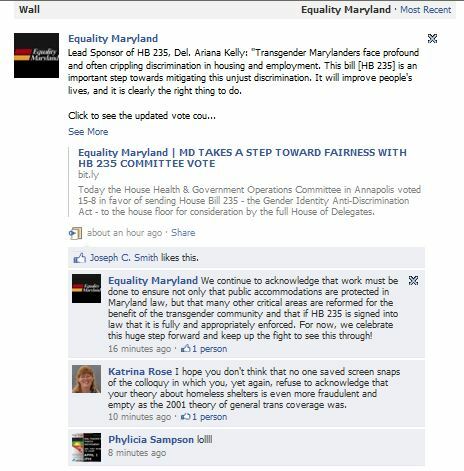 Unlike ‘Equality’ Maryland, I have no problem admitting when I make a mistake. 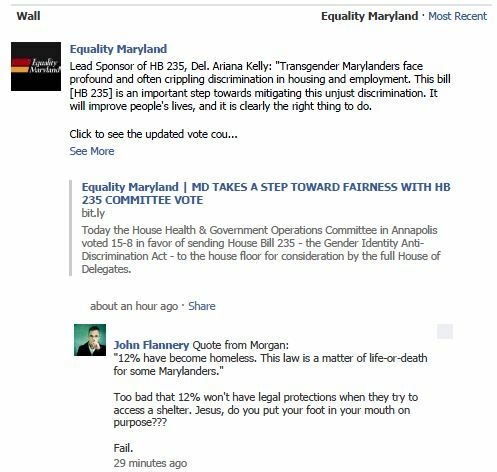 And ‘Equality’ Maryland keeps making ’em – like continuing to disappear reality-based comments and apparently continuing to think that no one keeps track.